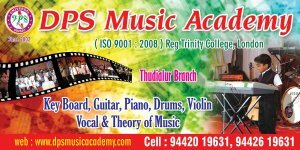 DPS Music Academy offers lessons in piano/keyboard, guitar, drums, Violin instruments from ages 5 to adult and Theory of music. Our Mission is to offer private musical instruction to ages 5 to adult, assisting students in meeting their goals; whether playing for enjoyment, playing within the community and in their church, or in competition . Through our classes, such as the choir, the Students learn to play and sing as a group and develop performance techniques.